Award-winning recording artist Suzi Shelton's infectious kid-friendly songs remind everyone that they can be comfortable in their own skin and express themselves joyously. Her style is eclectic-pop with a modern edge. Suzi's fourth album was co-produced by two of her band mates, Greg Mayo (Jon Bon Jovi, Blood, Sweat & Tears) and Dan Weiner (STOMP, America's Got Talent Band). 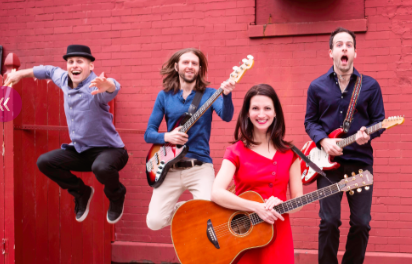 As the Brooklyn Spectator notes, “When Suzi Shelton takes the stage you know that something special is about to happen.” "Lively numbers that will engage kids and have them acting along with the songs." ~NAPPA (National Parenting Publications Awards) . Tickets available at the door. A light lunch will be served during coffee hour in the church after worship service. Join us for Sunday worship at 10:00, a light lunch at 11:15, then enjoy the concert at Noon.